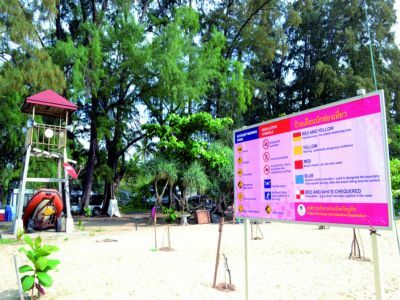 PHUKET: As we move slowly away from the monsoon season and a record number of tourist drownings at the beaches, the Phuket Gazette asked the president of the Phuket Lifeguards’ Association why he and his 82 colleagues aren’t at work. “The old contract for the Phuket Lifeguard Association to patrol Phuket’s beaches has expired and we are still waiting for the Phuket Provincial Administration Organization (OrBorJor) to contact us about making a new one. “Not having continual, “back-to-back” contracts affects our lifeguards. Many of them worry about whether they will be out of a job temporarily until a new contract is made, or permanently. “Some lifeguards work full time, and I worry some of them might leave the association because of this uncertainty. “Also, we cannot start any association activities that we have planned for this year since we do not know if we will continue being lifeguards or not. “The OrBorJor should start taking steps to make a new contract two to three months before any current contract expires. This would ensure lifeguards can continue working right after the old contract ends. “Having “rolling” contracts would make lifesaving and beach guarding much smoother. Tourists would feel safer too if they saw lifeguards on duty. Accidents in the sea are unpredictable. They can happen any day, any time. “If uncertainty about their jobs prompts lifeguards to quit, then we will have to train new ones. But that cannot be done in one or two days. It’s not that easy and takes quite some time. “To become a good lifeguard requires not only lifesaving skills, but also long-term experience in real situations. They need experience to feel confident in the surf. “For example, being a good swimmer in a pool and being a good swimmer in the sea are not the same. The conditions in the sea change every day. It takes years to become a skillful lifeguard and to understand the surf. “Ideally, we would not have lifeguards rescuing people, but rather we’d be stopping them from getting into dangerous situations at all. “To do this effectively, lifeguards need to know not only how to save a life, but also which areas are safe to swim in [on any given day] which areas are not. Only then can lifeguards know which areas to focus on. “Then comes beach management skills and handling tourists, which is another skill entirely. For the Gazette’s latest report from the OrBorJor, click here.